While writing the general case of the large sieve, one question of minor interest arose, which provides a nice exercise (or exam problem) for a course on finite-dimensional Hilbert spaces. Coming back to regular HTML, where one can make links, here’s one to the short note I wrote on this, with the proof of the result indicated. Note that I would be surprised is this were really at all new. 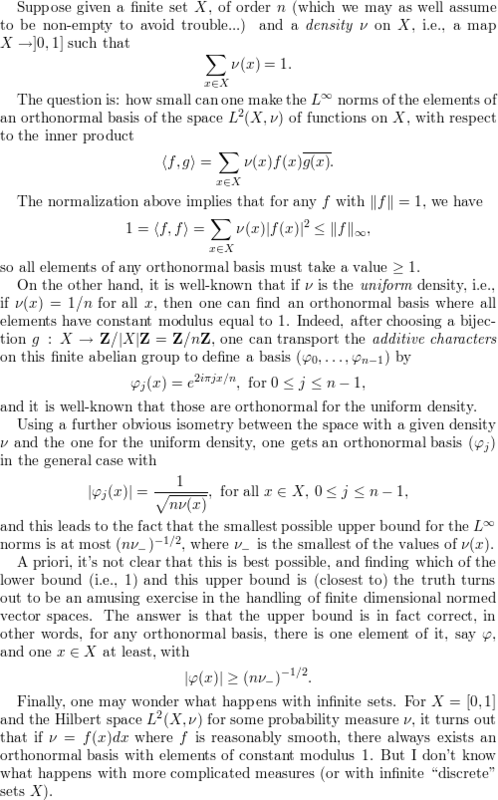 There’s one lingering question that I haven’t answered at the moment: does there exist a proof by pure thought that, for the uniform density, there is an orthonormal basis of functions with constant modulus 1? While browsing through some issues of Annals of Math. a few days ago, I read the following rather spectacular example of long-forgotten mathematical terminology. It is in a paper by A. Borel, “Groupes linéaires algébriques”, Annals of Math. 64, 1956, p. 20 to 82, which is one of the foundational papers of the whole theory of linear algebraic groups. In this paper, Borel found what groups could play in algebraic geometry the role that “tori” played in the theory of Lie groups (tori being there groups isomorphic to Rn/Zn). Reasonably enough, he decides to call them by the same name (“nous nous permettrons de leur donner le même nom”, or “we allow ourselves the right to give them the same name”). But they had been introduced also by Kolchin earlier (in papers on differential Galois theory from the later 40’s), for whom they were apparently “connected quasicompact (commutative) algebraic groups” (the adjective “commutative” being optional by virtue of a theorem of Kolchin). Similarly, it seems that unipotent groups were called “anticompact groups” by Kolchin. Beyond the example of tori (which shouldn’t be taken too seriously, and certainly not as a negative comment on Kolchin! ), maybe there is some lesson in this. Often, in particular when a new theory emerges, it’s not clear which concepts should be emphasized and which are less important (or more derivative; for Kolchin, the pivotal role of algebraic tori was probably not obvious at all). However, once the picture clarifies, the terminology should also bring this into focus, and the most basic concepts should have basic (and hopefully, short) names. For instance, one reason that modern algebraic geometry may seem appealing (for budding mathematicians of a certain kind in particular, whatever their technical inclinations might be) is that quite a lot of the vocabulary not only sounds nice (even almost poetic, of a sort), but is also well considered (from sheaves and schemes to étale and crystals…). On the other hand, I’ve tried a few times to read books on C*-algebras, and always find the terminology painful. One may wonder why to bother at all about such terminological issues. After all, in terms of mathematical content, a torus is a torus is a connected quasicompact commutative algebraic group. I must say I can’t really explain why I find this of any importance, but I do! In this first post, I am coming back to the first of the two papers already mentioned in my (second) first post, which is joint work with F. Jouve and D. Zywina, and titled “An explicit integral polynomial whose splitting field has Galois group W(E8)“. The paper’s avowed purpose is very straightforward to state: we give an explicit polynomial (call it P), monic and with integral coefficients (in fact, palindromic), of degree 240, with the stated property in the title. Here’s a PDF file containing it (if you print this file and stitch the pages together, any resemblance of the resulting outline shape with a surfboard, when viewed from afar, is entirely coincidental). In fact, I am not going to spend much time discussing the mathematical arguments in the paper. Rather, since the proof that P does indeed have the stated properties depends on computer help, I’m going to describe how this comes about, and more importantly explain why I believe we do have a proof of our statement, which is a valid mathematical proof of it (except maybe for the most paranoid among mathematicians). Note that I’m essentially a full-blooded mathématicien platonicien, and so it is a fairly serious matter to me to be sure that there is no cheating. Of course, there has been a lot of discussion of the use of computers in mathematical proofs, involving much more important results, but as is often the case, things can become a lot sharper in one’s mind when dealing with a specific problem, and for me this was the first time the question really arose. So, roughly, we must check that the Galois group (say G) of P is (1) not smaller than W; (2) not bigger than W. Both facts require some computer help, but in very different ways. I’ll discuss (1) now, and (2), which is more significant, in another post. For (1), the Magma mathematical software is used as some kind of database holding extensive information about W, and able to perform computations in it. Since W has order about 700,000,000, some mechanical help may seem indispensible, but in fact there is some chance that a pure thought proof of this first part could exist. And even if some computations are needed, one shouldn’t think it is impossible to get one’s hand (usefully) dirty with W: Élie Cartan, in 1896, computed its Jordan-Hölder series (there is a normal subgroup of index 2, and the quotient has a normal subgroup of order 2, with quotient simple, in fact isomorphic to an orthogonal group of dimension 8 over the field with 2 elements), and it’s safe to assume that he couldn’t just use his laptop for this purpose. We get information on the “size” of G by looking at the factorization pattern of P modulo primes: it is a standard, and very useful, fact of algebraic number theory that if P has no repeated root modulo a prime p, and factors as a product of n1 distinct linear factors, n2 distinct irreducible quadratic factors, and so on, then as a subgroup of the permutation group of the roots, G contains a permutation which is product of n1 1-cycles, n2 (disjoint) 2-cycles, and so on. Now, the computer knows about all (conjugacy classes of proper) maximal subgroups of W, and for each of them (say H), knows the cycle types of all conjugacy classes of elements of H. If by reduction modulo primes we find cycle types which do not all occur in such a maximal subgroup, then it is not possible that G be isomorphic to a subgroup of W. This is what happens when reducing modulo 7 and 11 (no more!). Note that here it is assumed implicitly that the cycle types which arise from reduction of P correspond to cycle types of element of W; this is not obvious a priori, and is in fact linked with the second part of the proof, and so I’m leaving some explanation for the second post. (For some context: there are only 112 conjugacy classes in W; they can be described in an abstract way which makes them manageable, as done by Carter for all Weyl groups). At first, this fact looked just like a lucky coincidence, highly dependent on being able to list the data mentioned above (maximal subgroups and their conjugacy classes). However, a closer look shows that we got (by luck, maybe) some not so random conjugacy classes. The first one is the square of the so-called Coxeter class c. Now, the latter is very canonical (it can be defined for all finite reflection groups, at least, and for the symmetric group on n letters, for instance, it is the class of the n-cycles), and it has many interesting properties. Fact of life: Let G be a proper subgroup of W, the Weyl group of E8, containing an element in the conjugacy class c2. Then G is contained in the kernel of the signature homomorphism. (Note that the signature can be defined on W without referring to the embedding in the permutation group of 240 objects). This statement (to me) seems reasonable enough that a direct proof could well exist (it does seem somewhat surprising, on the other hand). And, in a way, such a proof already exists: using the Jordan-Hölder series of W, one can check this using the printed Atlas of Finite Groups, and hence depend only on standard mathematical arguments and published literature, which is at least the usual standard of mathematical proof. But maybe there could be an argument even more conceptual. (2) The large sieve, monodromy and zeta functions of algebraic curves, II: independence of the zeros, where the issue of relations between zeros of L-functions is investigated in the case of finite fields, with the help of sieve methods and the Riemann Hypothesis of Deligne.